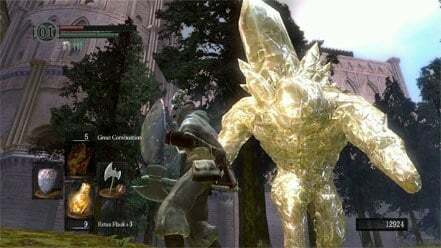 Golden Crystal Golem is a Boss in Dark Souls. These humanoid crystal beings are almost identical to their cousins with the exception of their gold complexion, larger size and health/defensive attributes, and the fact that they sometimes have NPCs stuck inside them. These do not respawn. After defeating the Hydra, move along the left side of the lake all the way to the back to find a Golden Crystal Golem standing there. Kill it to free Dusk of Oolacile. If you do not find it, you can quit and reload. There are two standing on crystal beams en route to Seath the Scaleless. Both of these Golden Crystal Golems are optional, although killing the first one will provide an easier route to the boss, as it does not respawn. After helping Siegmeyer of Catarina in Blighttown by giving him three pieces of purple moss, one will appear in the Duke's garden containing Sieglinde of Catarina. The Golden Golem swings its fist upwards, dealing very high physical damage and knocking you down if hit. It pulls its arm back before before punching, so it's quite easy to back away when the uppercut is imminent. The Golem throws a hook after a long wind up. This attack can knock the player down if it connects, and deals painful physical damage. This attack is similar to the punch but the Golem crystalizes its hand, adding more damage and a little more range on the attack. It still has the slow wind up so it can be dodged by rolling towards the direction of the punch but backwards. The Golden Crystal Golem momentarily lowers both arms before raising them high above his head, only to slam them onto the ground. This slam raises crystals from the ground (up to 2 meters) in front of the Golem and inflicts magic AoE damage. While they may be stronger, the AoE radius is smaller than that of the Crystal Golem. If you back away when the arms go up, you shouldn't have anything to worry about. The Golden Golem feels heroic and leaps into the air, only to thrust its fist down into the floor. This attack will drain the player's stamina and health, and has a decent range as well. As it will use this to close the space between the two, you can avoid it by not straying too far; additionally, when it's out of range and squats down, this attack is imminent, so back away. For Darkroot Basin Golden Crystal Golem, it helps to have the Rusted Iron Ring. Try to lure the ones in the Crystal Cave to larger patches of ground since their attacks have a great amount of stagger and knockback effect, and may blow you off the ledge, even when blocked. These two Golems can also be lured to falling to their deaths with no repercussions; just make use of the invisible paths. When luring the first, run back up the invisible path you just came from and to either side of the path. This will trigger it to use its leaping punch attack and plummet to its death. The same tactic can be used on the second, on the invisible path available on its level.